Choosing between Acura MDX/RDX, Lexus RX350. This is my 10cents worth ! I have owned two MDX's . For me anyway, it is the best vehicle I have ever owned. I love that there is plenty of power at any speed and of course, any midsized to large SUV gives you the better visibility and feeling of at least being competitive in size out there on the road. I have two relatives who own the RDX and I recently spent time testing the RDX when researching for my current vehicle . The RDX offers the advantage of being a bit smaller and thus is more maneuverable in parking lots or in the city. I got interested when Acura gave the RDX the 6 cylinder engine. HOWEVER, that being said, I backed away from the RDX because after I had been in the seat after about 15 or 20 minutes, I started getting uncomfortable . I think they skimped on the cushioning,which is a deal breaker for me. The MDX seat is comfortable even after a couple hours in the seat. That is something to consider. I spent some time with the Lexus RX. and I wanted to love it . I really did ! One of my girlfriends test drove the Lexus RX and loved it , so each to their own. The lexus handles beautifully and is a smooth ride. I just find it boring ! The Acuras are just more fun ! And that is just personal opinion ! One thing you might consider inquiring about - I bought a 2016 MDX and had two safety features added, as of course the two I wanted were on the accessory list ! But they are well worth it . One is a beeper that when you back up and get within a certain distance of something behind you, the beeping starts and goes faster as you get closer . It also " sees " things moving , like a car, that you might not see, and it beeps when you are in Reverse. If you can get it, well worth the money. The other is a sensor that alerts you to a car in your blind spot. I am not good about backing up and I am not good about seeing someone on my right side ! I nearly captured 3 cars in the time I had my first MDX and all on my right side ! If you get the RDX , that should be less of a problem . Maybe Lexus comes standard with those two features ! Good luck, you are looking at three great makes of vehicles ! They all get about the same mileage. I average around 21 mpg. Thank you for the responses, Member 3676! The info you provided is very helpful. I realize that in general Lexuses are more comfortable. But the availability of 3rd row is the reason I am considering an MDX. I just sidetracked when I included RDX in the mix, which I shouldn't have. I do not understand what you mean when you said "Lexus has prettier bathrooms ! LOL"
For smooth ride over potholes, gosh, I think Lexus might hold the lead there . I recommend that you test drive both the MDX and Lexus. Lexus in particular will let you take a car for 24 hours . Just ask and show ID ! They are very generous. For seat comfort, we are all different. I am 5'5" and weigh around 138 . If you are a 6 foot male at around 200 pounds, you will experience things differently. It seems to me that the Lexus seat started to bother me after 30 minutes or so, but it is a vague memory , so you should check for yourself. Quality of materials , i think the reviewers give it to Lexus . I think Lexus is prettier inside . Nice wood or fake wood and accents. 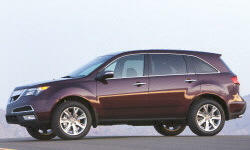 I do know that MDX gives you more room shoulder wise and between the driver and passenger. The leather has worn very well on my 2009 MDX. My son and daughter in law bought it from me so I see it every so often. My new MDX is midnight blue and a very pretty vehicle on the outside and neat and functional on the inside. As to bathrooms - well, I presume that all the Lexus dealerships are similar. You have to go into the dealership and go into the bathroom ! Awesome ! I wanted to linger ! LOL Oh and the free donuts and fresh fruit ! Let's just say I was impressed ! One last comment as to ride. Once I was driving on I5 going to Seattle. I reached to do something with the radio or CD player and looked up and had come very close to a car on my left side. I made the classic mistake of jerking the wheel to the right and then back to the left . The MDX was bouncing but it stayed true and I did not lose control. Oh, I was going around 70 or 75 miles per hour. My MDX was equipped with the all wheel drive system and I give it credit for keeping me safe in those seconds. I would never get just a front wheel drive. But then, I am here in the Pacific Northwest and with the heavy rains and snow, it is really a very necessary item. If you live in Southern California, you probably don't feel that you need it . Good luck ! Go test drive those cars ! Take the Lexus for 24 hours. I think Acura will do the same,but talk to them. I was always certain of what I could tolerate after an hour or two and never asked for longer. Member3676, thank you very much. Your 10 cents feedback is much more than a dollar!!!!! Appreciate it. If you want 3-row that is more than kid friendly in the 3rd row and offers the most cargo space behind the 3rd seat, the Buick Enclave offers the most space and smooth ride. Also consider GMC Acadia and Chevy Traverse on the same platform but with contents and market targets.